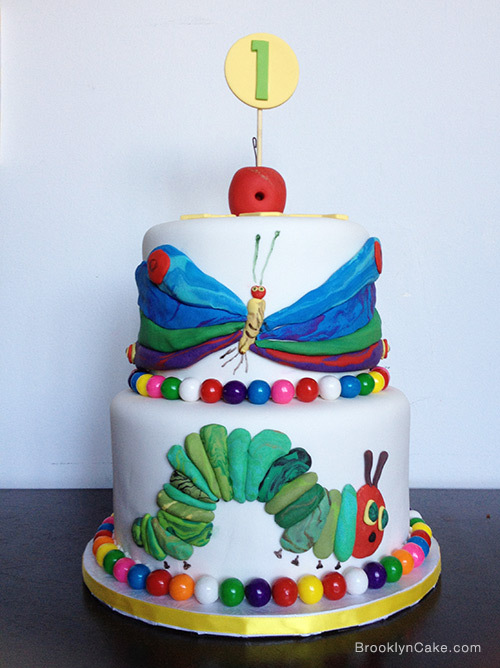 Children’s books are a common theme many clients choose for their children’s birthday cakes. This cake was no exception. As a matter of fact, the client had seen this design on another cake and was hoping for a replica. Copying other cakes or components of them are a normal part of being in the cake decorating industry. Of course, at Brooklyn Cake we always strive to make the design or own or take the workmanship to the next level. We were literally working on this cake with the book open to reference and attempt to replicate the amazing paper texture/effect that E. Carle books always have in their illustrations. We custom-mixed individual colors then braided and kneaded them partially together to achieve the marbled effect on each caterpillar segment as well as the butterfly wings. Further looking into the theme, we designed a topper that would match the birthday’s girl, by picking the apple for the number “1”. We even punched a hole into our apple for the holes that appear in the book. Other cakes based on books in our gallery are the Ten Ladybugs Cake, the Harry Potter cake and the Sorting Hat Cake. Some other themed children’s cakes are the Lightning McQueen Tire Cake, the Mickey Mouse Clubhouse Cake and the Spongebob Squarepants Cake.